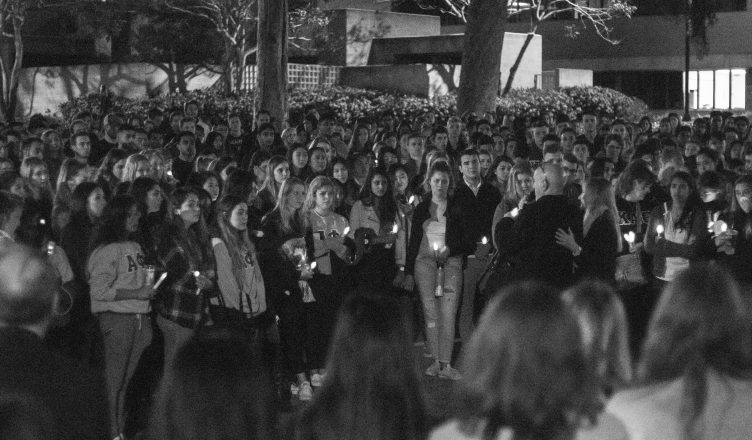 Over one hundred students attended a candlelight vigil on April 2 at Warren Mall honoring the memories of UC San Diego seniors Anna Wilson and Amanda Korbas, who passed away in a fatal car accident over spring break. Family and friends told stories of the two girls, and concluded the vigil with a moment of silence. On Wednesday, March 28, Wilson and Korbas were travelling with their friends in Rocky Point, Mexico at night on a dimly-lit road. The driver of the vehicle couldn’t see well and hit a palm tree. Wilson died in the accident while Korbas died en route to the hospital according to a report made by a local Mexican newspaper. The other two passengers, brothers Denisse Alexander and Carlos, were injured but reported stable. Carlos, the driver, was taken into custody at the time of the accident by the prosecutor’s office, who will be involved in the investigation of the incident. Margo Nicole, a close friend of Wilson and Korbas, described the candlelight vigil as a wonderful experience. The parents of each girl spoke, and students supported each other when they got emotional. One of the mothers was quoted saying that her daughter wouldn’t want her death to cause anyone pain, and that those in attendance should focus on loving one another. Nicole described Wilson and Korbas as selfless, kind, and unique individuals. According to Nicole, Wilson wanted to dedicate her life to volunteer work and bettering communities around the world. “She frequently volunteered at a local soup kitchen and even was accepted into the Peace Corps,” Nicole said. Nicole explained that Amanda earned her pilot’s license last year and was going to graduate and then work her dream job with Disney. “Both girls cared deeply for others, had big dreams, and made the most of each day of their lives,” Nicole said. Wilson and Korbas were also involved in the Panhellenic community: Korbas, a member of Kappa Alpha Theta and Wilson, a member of Alpha Phi. The Korbas family started a GoFundMe account as a result of the incident, and plans to use the money raised to work with a council of Mexican and American citizens in Puerto Penasco to improve lighting and signage on the poorly-lit road where the accident occurred. “The accident, while tragic, was not was not caused by drunk driving nor reckless driving. It was mainly the result of a widely acknowledged, very dangerous, poorly lighted and designed stretch of road,” said Anton Korbas, father of Amanda Korbas, on the GoFundMe page. Anton Korbas also added that if any issues were to arise regarding using the money made for that purpose, the money would then be donated to the Make A Wish Foundation, Amanda Korbas’ favorite charity.